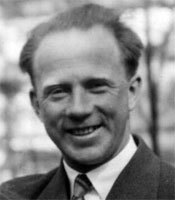 WERNER HEISENBERG (1901–1976) was born in Würzberg, Germany, and received his doctorate in theoretical physics from the University of Munich. He became famous for his groundbreaking Uncertainty (or Indeterminacy) Principle and was the recipient of The Nobel Prize in Physics 1932. After World War II he was named director of the Max Planck Institute for Physics and Astrophysics. One evening during the Solvay Conference, some of the younger members stayed behind in the lounge of the hotel. 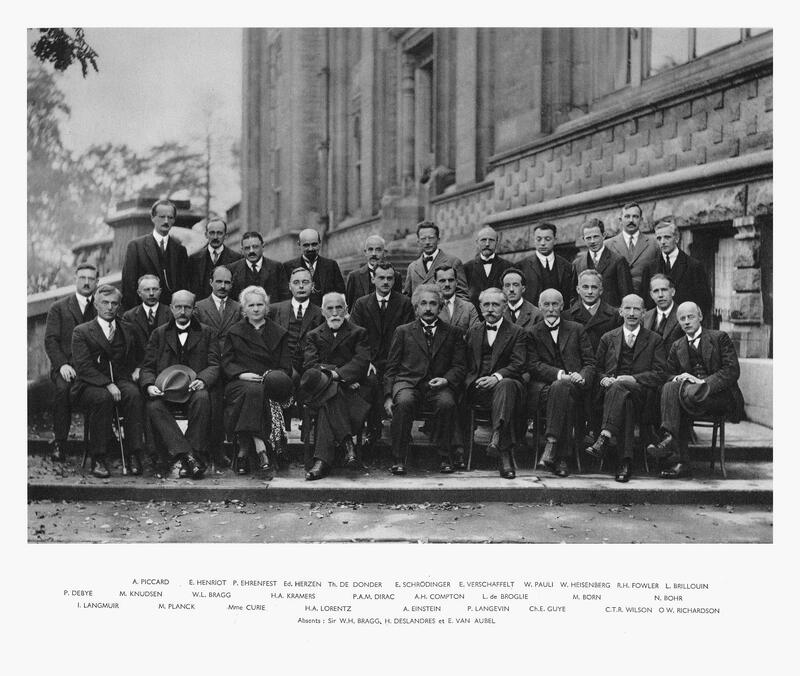 This group included Wolfgang Pauli and myself, and was soon afterward joined by Paul Dirac. One of us said: "Einstein keeps talking about God: what are we to make of that? It is extremely difficult to imagine that a scientist like Einstein should have such strong ties with a religious tradition." "Not so much Einstein as Max Planck," someone objected. "From some of Planck's utterances it would seem that he sees no contradiction between religion and science, indeed that he believes the two are perfectly compatible." I was asked what I knew of Planck's views on the subject, and what I thought myself. I had spoken to Planck on only a few occasions, mostly about physics and not about general questions, but I was acquainted with some of Planck's close friends, who had told me a great deal about his attitude. "I assume," I must have replied, "that Planck considers religion and science compatible because, in his view, they refer to quite distinct facets of reality. Science deals with the objective, material world. It invites us to make accurate statements about objective reality and to grasp its interconnections. Religion, on the other hand, deals with the world of values. It considers what ought to be or what we ought to do, not what is. In science we are concerned to discover what is true or false; in religion with what is good or evil, noble or base. Science is the basis of technology, religion the basis of ethics. In short, the conflict between the two, which has been raging since the eighteenth century, seems founded on a misunderstanding, or, more precisely, on a confusion of the images and parables of religion with scientific statements. Needless to say, the result makes no sense at all. This view, which I know so well from my parents, associates the two realms with the objective and subjective aspects of the world respectively. Science is, so to speak, the manner in which we confront, in which we argue about, the objective side of reality. Religious faith, on the other hand, is the expression of the subjective decisions that help us choose the standards by which we propose to act and live. Admittedly, we generally make these decisions in accordance with the attitudes of the group to which we belong, be it our family, nation, or culture. Our decisions are strongly influenced by educational and environmental factors, but in the final analysis they are subjective and hence not governed by the 'true or false' criterion. Max Planck, if I understand him rightly, has used this freedom and come down squarely on the side of the Christian tradition. His thoughts and actions, particularly as they affect his personal relationships, fit perfectly into the framework of this tradition, and no one will respect him the less for it. As far as he is concerned, therefore, the two realms—the objective and the subjective facets of the world—are quite separate, but I must confess that I myself do not feel altogether happy about this separation. I doubt whether human societies can live with so sharp a distinction between knowledge and faith." Wolfgang shared my concern. "It's all bound to end in tears," he said. "At the dawn of religion, all the knowledge of a particular community fitted into a spiritual framework, based largely on religious values and ideas. The spiritual framework itself had to be within the grasp of the simplest member of the community, even if its parables and images conveyed no more than the vaguest hint as to their underlying values and ideas. But if he himself is to live by these values, the average man has to be convinced that the spiritual framework embraces the entire wisdom of his society. For 'believing' does not to him mean 'taking for granted,' but rather 'trusting in the guidance' of accepted values. That is why society is in such danger whenever fresh knowledge threatens to explode the old spiritual forms. The complete separation of knowledge and faith can at best be an emergency measure, afford some temporary relief. In western culture, for instance, we may well reach the point in the not too distant future where the parables and images of the old religions will have lost their persuasive force even for the average person; when that happens, I am afraid that all the old ethics will collapse like a house of cards and that unimaginable horrors will be perpetrated. In brief, I cannot really endorse Planck's philosophy, even if it is logically valid and even though I respect the human attitudes to which it gives rise. "Einstein's conception is closer to mine. His God is somehow involved in the immutable laws of nature. Einstein has a feeling for the central order of things. He can detect it in the simplicity of natural laws. We may take it that he felt this simplicity very strongly and directly during his discovery of the theory of relativity. Admittedly, this is a far cry from the contents of religion. I don't believe Einstein is tied to any religious tradition, and I rather think the idea of a personal God is entirely foreign to him. But as far as [Einstein] he is concerned there is no split between science and religion: the central order is part of the subjective as well as the objective realm, and this strikes me as being a far better starting point. "A starting point for what?" I asked. "If you consider man's attitude to the central order a purely personal matter, then you may agree with Einstein's view, but then you must also concede that nothing at all follows from this view." "Perhaps it does," Wolfgang replied. "The development of science during the past two centuries has certainly changed man's thinking, even outside the Christian West. Hence it matters quite a bit what physicists think. And it was precisely the idea of an objective world running its course in time and space according to strict causal laws that produced a sharp clash between science and the spiritual formulations of the various religions. If science goes beyond this strict view—and it has done just that with relativity theory and is likely to go even further with quantum theory—then the relationship between science and the contents religions try to express must change once again. Perhaps science, by revealing the existence of new relationships during the past thirty years, may have lent our thought much greater depth. The concept of complementarity, for instance, which Niels Bohr considers so crucial to the interpretation of quantum theory, was by no means unknown to philosophers, even if they did not express it so succinctly. However, its very appearance in the exact sciences has constituted a decisive change: the idea of material objects that are completely independent of the manner in which we observe them proved to be nothing but an abstract extrapolation, something that has no counterpart in nature. In Asiatic philosophy and Eastern religions we find the complementary idea of a pure subject of knowledge, one that confronts no object. This idea, too, will prove an abstract extrapolation, corresponding to no spiritual or mental reality. If we think about the wider context, we may in the future be forced to keep a middle course between these extremes, perhaps the one charted by Bohr's complementarity concept. Any science that adapts itself to this form of thinking will not only be more tolerant of the different forms of religion, but, having a wider overall view, may also contribute to the world of values." Paul Dirac had joined us in the meantime. He [Paul Dirac] had only just turned twenty-five, and had little time for tolerance. "I don't know why we are talking about religion," he objected. "If we are honest—and scientists have to be—we must admit that religion is a jumble of false assertions, with no basis in reality. The very idea of God is a product of the human imagination. It is quite understandable why primitive people, who were so much more exposed to the overpowering forces of nature than we are today, should have personified these forces in fear and trembling. But nowadays, when we understand so many natural processes, we have no need for such solutions. I can't for the life of me see how the postulate of an Almighty God helps us in any way. What I do see is that this assumption leads to such unproductive questions as why God allows so much misery and injustice, the exploitation of the poor by the rich and all the other horrors He might have prevented. If religion is still being taught, it is by no means because its ideas still convince us, but simply because some of us want to keep the lower classes quiet. Quiet people are much easier to govern than clamorous and dissatisfied ones. They are also much easier to exploit. Religion is a kind of opium that allows a nation to lull itself into wishful dreams and so forget the injustices that are being perpetrated against the people. Hence the close alliance between those two great political forces, the State and the Church. Both need the illusion that a kindly God rewards—in heaven if not on earth—all those who have not risen up against injustice, who have done their duty quietly and uncomplainingly. That is precisely why the honest assertion that God is a mere product of the human imagination is branded as the worst of all mortal sins." "You are simply judging religion by its political abuses," I objected, "and since most things in this world can be abused—even the Communist ideology which you recently propounded—all such judgments are inadmissible. After all, there will always be human societies, and these must find a common language in which they can speak about life and death, and about the wider context in which their lives are set. The spiritual forms that have developed historically out of this search for a common language must have had a great persuasive force—how else could so many people have lived by them for so many centuries? Religion can't be dismissed so simply as all that. But perhaps you are drawn to another religion, such as the old Chinese, in which the idea of a personal God does not occur?" "I dislike religious myths on principle," Dirac replied, "if only because the myths of the different religions contradict one another. After all, it was purely by chance that I was born in Europe and not in Asia, and that is surely no criterion for judging what is true or what I ought to believe. And I can only believe what is true. As for right action, I can deduce it by reason alone from the situation in which I find myself: I live in society with others, to whom, in principle, I must grant the same rights I claim for myself. I must simply try to strike a fair balance; no more can be asked of me. All this talk about God's will, about sin and repentance, about a world beyond by which we must direct our lives, only serves to disguise the sober truth. Belief in God merely encourages us to think that God wills us to submit to a higher force, and it is this idea which helps to preserve social structures that may have been perfectly good in their day but no longer fit the modern world. All your talk of a wider context and the like strikes me as quite unacceptable. Life, when all is said and done, is just like science: we come up against difficulties and have to solve them. And we can never solve more than one difficulty at a time; your wider context is nothing but a mental superstructure added a posteriori." And so the discussion continued, and we were all of us surprised to notice that Wolfgang was keeping so silent. He would pull a long face or smile rather maliciously from time to time, but he said nothing. In the end, we had to ask him to tell us what he thought. He seemed a little surprised and then said: "Well, our friend Dirac, too, has a religion, and its guiding principle is: 'There is no God and Dirac is His prophet.'" We all laughed, including Dirac, and this brought our evening in the hotel lounge to a close. Some time later, probably in Copenhagen, I told Niels about our conversation. He immediately jumped to the defense of the youngest member of our circle. "I consider it marvelous," he said, "that Paul should be so uncompromising in his defense of all that can be expressed in clear and logical language. He believes that what can be said at all can be said clearly—or, as Wittgenstein put it, that 'whereof one cannot speak thereof one must be silent.' Whenever Dirac sends me a manuscript, the writing is so neat and free of corrections that merely looking at it is an aesthetic pleasure. If I suggest even minor changes, Paul becomes terribly unhappy and generally changes nothing at all. His work is, in any case, quite brilliant. Recently the two of us went to an exhibition which included a glorious gray-blue seascape by Manet. In the foreground was a boat, and beside it, in the water, a dark gray spot, whose meaning was not quite clear. Dirac said, 'This spot is not admissible.' A strange way of looking at art, but he was probably quite right. In a good work of art, just as in a good piece of scientific work, every detail must be laid down quite unequivocally; there can be no room for mere accident. "Still, religion is rather a different matter. I feel very much like Dirac: the idea of a personal God is foreign to me. But we ought to remember that religion uses language in quite a different way from science. The language of religion is more closely related to the language of poetry than to the language of science. True, we are inclined to think that science deals with information about objective facts, and poetry with subjective feelings. Hence we conclude that if religion does indeed deal with objective truths, it ought to adopt the same criteria of truth as science. But I myself find the division of the world into an objective and a subjective side much too arbitrary. The fact that religions through the ages have spoken in images, parables, and paradoxes means simply that there are no other ways of grasping the reality to which they refer. But that does not mean that it is not a genuine reality. And splitting this reality into an objective and a subjective side won't get us very far. "That is why I consider those developments in physics during the last decades which have shown how problematical such concepts as 'objective' and 'subjective' are, a great liberation of thought. The whole thing started with the theory of relativity. In the past, the statement that two events are simultaneous was considered an objective assertion, one that could be communicated quite simply and that was open to verification by any observer. Today we know that 'simultaneity' contains a subjective element, inasmuch as two events that appear simultaneous to an observer at rest are not necessarily simultaneous to an observer in motion. However, the relativistic description is also objective inasmuch as every observer can deduce by calculation what the other observer will perceive or has perceived. For all that, we have come a long way from the classical ideal of objective descriptions. "In quantum mechanics the departure from this ideal has been even more radical. We can still use the objectifying language of classical physics to make statements about observable facts. For instance, we can say that a photographic plate has been blackened, or that cloud droplets have formed. But we can say nothing about the atoms themselves. And what predictions we base on such findings depend on the way we pose our experimental question, and here the observer has freedom of choice. Naturally, it still makes no difference whether the observer is a man, an animal, or a piece of apparatus, but it is no longer possible to make predictions without reference to the observer or the means of observation. To that extent, every physical process may be said to have objective and subjective features. The objective world of nineteenth-century science was, as we know today, an ideal, limiting case, but not the whole reality. Admittedly, even in our future encounters with reality we shall have to distinguish between the objective and the subjective side, to make a division between the two. But the location of the separation may depend on the way things are looked at; to a certain extent it can be chosen at will. Hence I can quite understand why we cannot speak about the content of religion in an objectifying language. The fact that different religions try to express this content in quite distinct spiritual forms is no real objection. Perhaps we ought to look upon these different forms as complementary descriptions which, though they exclude one another, are needed to convey the rich possibilities flowing from man's relationship with the central order." "Mathematicians, as everyone knows, work with an imaginary unit, the square root of –1, called i. We know that i does not figure among the natural numbers. Nevertheless, important branches of mathematics, for instance the theory of analytical functions, are based on this imaginary unit, that is, on the fact that -1 exists after all. Would you agree that the statement 'There is a -1' means nothing else than 'There are important mathematical relations that are most simply represented by the introduction of the -1 concept'? And yet these relations would exist even without it. That is precisely why this type of mathematics is so useful even in science and technology. What is decisive, for instance, in the theory of functions, is the existence of important mathematical laws governing the behavior of pairs of continuous variables. These relations are rendered more comprehensible by the introduction of the abstract concept of -1, although that concept is not basically needed for our understanding, and although it has no counterpart among the natural numbers. An equally abstract concept is that of infinity, which also plays a very important role in modern mathematics. It, too, has no correlate, and moreover raises grave problems. In short, mathematics introduces ever higher stages of abstraction that help us attain a coherent grasp of ever wider realms. To get back to our original question, is it correct to look upon the religious 'there is' as just another, though different, attempt to reach ever higher levels of abstraction? An attempt to facilitate our understanding of universal connections? After all, the connections themselves are real enough, no matter into what spiritual forms we try to fit them." "With respect to the epistemological side of the problem, your comparison may pass," Bohr replied. "But in other respects it is quite inadequate. In mathematics we can take our inner distance from the content of our statements. In the final analysis mathematics is a mental game that we can play or not play as we choose. Religion, on the other hand, deals with ourselves, with our life and death; its promises are meant to govern our actions and thus, at least indirectly, our very existence. We cannot just look at them impassively from the outside. Moreover, our attitude to religious questions cannot be separated from our attitude to society. Even if religion arose as the spiritual structure of a particular human society, it is arguable whether it has remained the strongest social molding force through history, or whether society, once formed, develops new spiritual structures and adapts them to its particular level of knowledge. Nowadays, the individual seems to be able to choose the spiritual framework of his thoughts and actions quite freely, and this freedom reflects the fact that the boundaries between the various cultures and societies are beginning to become more fluid. But even when an individual tries to attain the greatest possible degree of independence, he will still be swayed by the existing spiritual structures—consciously or unconsciously. For he, too, must be able to speak of life and death and the human condition to other members of the society in which he's chosen to live; he must educate his children according to the norms of that society, fit into its life. Epistemological sophistries cannot possibly help him attain these ends. Here, too, the relationship between critical thought about the spiritual content of a given religion and action based on the deliberate acceptance of that content is complementary. And such acceptance, if consciously arrived at, fills the individual with strength of purpose, helps him to overcome doubts and, if he has to suffer, provides him with the kind of solace that only a sense of being sheltered under an all-embracing roof can grant. In that sense, religion helps to make social life more harmonious; its most important task is to remind us, in the language of pictures and parables, of the wider framework within which our life is set." "You keep referring to the individual's free choice," I said, "and you compare it with the freedom with which the atomic physicist can arrange his experiments in this way or that. Now the classical physicist had no such freedom. Does that mean that the special features of modern physics have a more direct bearing on the problem of the freedom of the will? As you know, the fact that atomic processes cannot be fully determined is often used as an argument in favor of free will and divine intervention." "I am convinced that this whole attitude is based on a simple misunderstanding, or rather on the confusion of questions, which, as far as I can see, impinge on distinct though complementary ways of looking at things. If we speak of free will, we refer to a situation in which we have to make decisions. This situation and the one in which we analyze the motives of our actions or even the one in which we study physiological processes, for instance the electrochemical processes in our brain, are mutually exclusive. In other words, they are complementary, so that the question whether natural laws determine events completely or only statistically has no direct bearing on the question of free will. Naturally, our different ways of looking at things must fit together in the long run, i.e., we must be able to recognize them as noncontradictory parts of the same reality, though we cannot yet tell precisely how. When we speak of divine intervention, we quite obviously do not refer to the scientific determination of an event, but to the meaningful connection between this event and others or human thought. Now this intellectual connection is as much a part of reality as scientific causality; it would be much too crude a simplification if we ascribed it exclusively to the subjective side of reality. Once again we can learn from the analogous situation in natural science. There are well-known biological relations that we do not describe causally, but rather finalistically, that is, with respect of their ends. We have only to think of the healing process in an injured organism. The finalistic interpretation has a characteristically complementary relationship to the one based on physico-chemical or atomic laws; that is, in the one case we ask whether the process leads to the desired end, the restoration of normal conditions in the organism; in the other case we ask about the causal chain determining the molecular processes. The two descriptions are mutually exclusive, but not necessarily contradictory. We have good reason to assume that quantum-mechanical laws can be proved valid in a living organism just as they can in dead matter. For all that, a finalistic description is just as valid. I believe that if the development of atomic physics has taught us anything, it is that we must learn to think more subtly than in the past." "We always come back to the epistemological side of religion," I objected. "But Dirac's attack on religion was aimed chiefly at its ethical side. Dirac disapproves quite particularly of the dishonesty and self-deception that are far too often coupled to religious thought. But in his abhorrence he has become a fanatic defender of rationalism, and I have the feeling that rationalism is not enough." 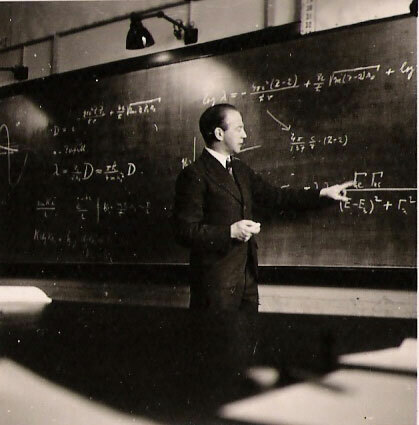 "I think Dirac did well," Niels said, "to warn you so forcefully against the dangers of self-deception and inner contradictions; but Wolfgang was equally right when he jokingly drew Dirac's attention to the extraordinary difficulty of escaping this danger entirely." Niels closed the conversation with one of those stories he liked to tell on such occasions: "One of our neighbors in Tisvilde once fixed a horseshoe over the door to his house. When a mutual acquaintance asked him, 'But are you really superstitious? Do you honestly believe that this horseshoe will bring you luck?' he replied, 'Of course not; but they say it helps even if you don't believe it.'" From Physics and Beyond, By Werner Heisenberg, (Harper & Row, 1971). Republished in Physics And Philosophy: The Evolution Of Modern Science by Werner Heisenberg, (Harper Perrennial, 2007).